This article first appeared on KameaWorld.com, a blog that aims to present valuable info and tips on eco-conscious and healthy living. You will find inspirational, educational, and up-do-date posts on eco-design, mind-body wellness, & transformative traveling by Kamea Chang. “Detoxing” is all the hype these days: juicing, water fasting; you name it. Our food industry has been filled with (expensive) products claiming to be able to “cleanse” our bodies. Unfortunately, there is no such thing as a “cleansing” or “detoxing” diet or drink. While it may sound reasonable to compare our esophagus, stomach, and intestinal tubes to sink drains—which require regular liquid cleanses or scrubbing in order to flush out impurities—it is important to remember that our bodies are extremely complex living systems. The idea that you need to eat a special meal or drink a special beverage to eliminate toxins from your body is just a pure marketing ploy and completely underestimates the amazing functions your body is capable of. Meet your liver, kidneys, lungs, gastrointestinal tract, and skin, vital organs that have been detoxifying your body since day one. It is their job to keep the good stuff in and flush the bad stuff out. So, your best way to detox is just to keep your entire body healthy so that your organs can function properly. Most of the time, the “detox” labels on fresh juices or meals are really just fancier marketing strategies used to denote something made with pure ingredients or something rich in nutrients. So, there is no inherent danger in consuming these types of “detox” products because many of them are indeed nutritious. However, one potential danger of buying into this concept is in thinking that you can afford to eat and drink unhealthily for weeks and then go on a three-day cleanse to undo the previous weeks of harm. Especially if the cleanse is not planned properly (i.e., not nutritionally balanced) or is extreme in nature (i.e., liquid-fasting for more than a few days), it may just do your body more harm than good. So, what is your one and only effective way to help your body detox itself effectively? Chocolate. More seductive than David Beckham stripped down to his underwear. Biting into a rich, chocolatey dessert is a sensual experience. My taste buds are salivating just thinking about it. There was a time when I’d treat myself to a little chocolate everyday. I was convinced it was a healthy habit. With all the health claims surrounding it, chocolate seems too good to be true. It is touted for high antioxidant levels, supporting the cardiovascular system and the ability to boost mood. I recently had to ease-up on my love affair with chocolate. Something in it is causing my psoriasis to flare and it induces a terrible bout of heart burn. Now I am questioning all the claims celebrating this magical superfood. What are the real health facts on chocolate? Yes, chocolate is high in antioxidants. It contains flavanols, which are a type of flavonoid or antioxidant that repair damage in the body and are shown to improve vascular health. Yet, chocolate goes through a fermentation and drying process that significantly lowers it’s flavanols. Then on top of that, any heating from melting causes it to lower even more. By the time a chocolate bar touches your tongue, the antioxidant levels are much lower than when first plucked from the cocoa pod.Cranberries, apples, peanuts, onions, tea and other foods also contain flavanols. But unlike chocolate, these foods are eaten with little processing and preserve their naturally occurring levels. Yes, iron, magnesium, phosphorus, potassium, zinc, copper, manganese, selenium and a variety of B vitamins, including thiamin, riboflavin, niacin, vitamin B6 and folate are all found in chocolate. Studies have shown that the antioxidant flavanols in chocolate have positive influences on cardiovascular health, such as lowering blood pressure, improving blood flow to the brain and heart, and making blood platelets less sticky and able to clot. But as mentioned above, flavanols are present in many other foods without the added sugar of a candy bar. A fake study circulated the media last year declaring that chocolate helps you lose weight. This was a ploy by a science journalist to demonstrate just how easily bad nutrition science is disseminated across popular news wires.The journalist went to the trouble of designing a flawed study, conducting the experiment, and publishing the findings in a scientific journal. All studies are subject to a peer review before publishing, yet this one slipped through a crack, no reviews completed, and right into the media’s hands. The Huffington Post, NPR, Daily Mail, Mother Nature Network and many others shared the findings that eating a 1.5-ounce bar of dark chocolate each day helped study participants lose weight. That translates to 210 calories and 19 grams of sugar.Chocolate is not correlated with weight lose. It is a calorie-dense food and is best eaten in moderation. Whether or not chocolate is healthy depends on the processing and the additives. Chocolate can go through rigorous refining before it gets into your hands. What sweeteners, oils or other foods have been added that are competing with it’s healthy compounds?If you’ve ever tasted plain cocoa powder or a cacao nib then you understand how much sugar is needed to turn it into a decadent dessert. Most of us aren’t eating 100% dark chocolate. We go for the sweet stuff. And sugar is sugar.The human body absolutely does not require sugar to meet it’s nutritional needs. It is simply empty calories and actually damages our cells.So if you’re eating chocolate for the health benefits, take a close look at the ingredients. Choose 80% or higher cocoa content and look for brands that make chocolate at low temperatures to maintain it’s naturally occurring nutrients. Right now, I’m enjoying carob powder as a chocolate alternative. Carob does not have caffeine or theobromine, which may explain my negative reactions to chocolate. My body is overly sensitive to stimulants. Carob has a mellow, chalky taste and naturally contains more sugar than chocolate so it is tasty without any added sweetener. Go ahead and treat yourself. Chocolate does have healthful properties. Just be aware that the purest form, with minimal processing and little added sugar is the best option. Five years. Numerous new scientific findings. Zero progress. 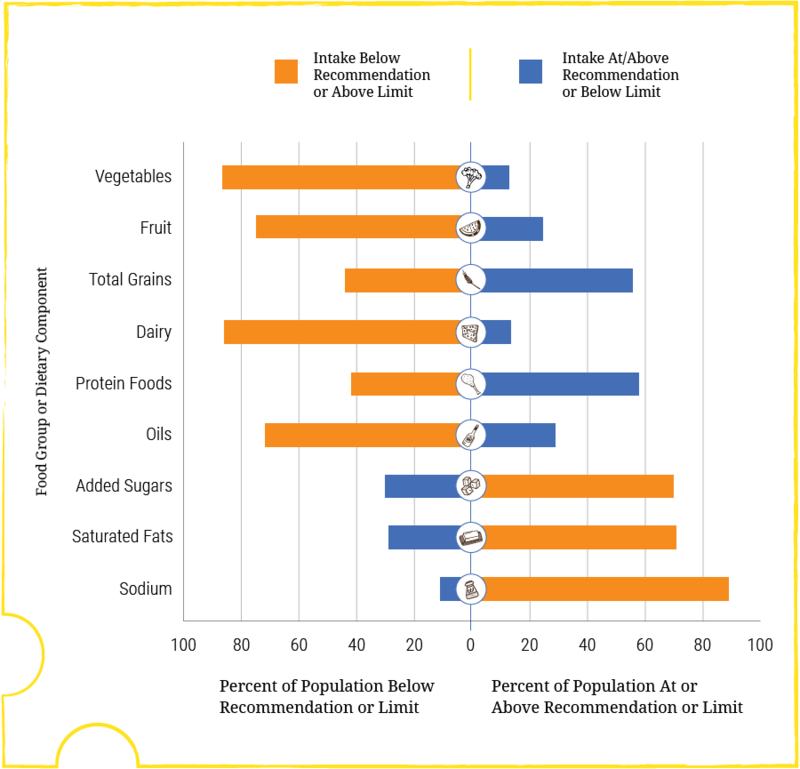 The 2015 Dietary Guidelines for Americans launched last week and the bad advice continues. It encourages multiple servings of refined grains, low-fat dairy, lean protein and limiting saturated fat. Six servings of grains are recommended per day, with three of those coming from refined grains. I have nothing against whole grains but to suggest that we consume the refined variety is one of the reasons we’re dealing with an obesity epidemic. Refined grains are white flour and white rice that have been processed to remove the most nutritious parts of the food. These are metabolized immediately in the body as glucose, spiking insulin levels. The day-after-day effects of this can and will eventually lead to diabetes. And the government wants us to consume three serving of these foods every day. Full-fat dairy is healthier, and more nutrient-rich than low-fat. Yet the US Guidelines strictly recommends the later. When you consume a whole food, you get the whole package of nutrients working together. Whole dairy contains butyrate, phytanic acid, trans palmitoleic acid, and conjugated linoleic acid that have beneficial effects not found in low-fat dairy. Low-fat dairy is basically skimming off all the good stuff our body needs. High-fat dairy is less likely to contribute to obesity than low-fat and No studies point to low-fat dairy being healthier. A low-fat recommendation is done primarily to reduce the high saturated fat content. I’ll discuss this next. Now this category is most concerning. The government suggests only oils be consumed and all saturated fats be limited to under ten percent. I wrote a detailed post on the benefits of animals fats verses the harmful effects of seed oils here. This is contradictory to current studies showing that seed oils actually reduce HDL cholesterol (the good stuff) when they reduce LDL cholesterol. So they do more harm than good. Saturated fats boost the good cholesterol in our bodies. For more convincing evidence, read the work of Nina Teicholz, The Big Fat Surprise. She explains how our 30 year low-fat craze is based on very week epidemiological studies. But there is a victory to celebrate. Trans fats are on the outs for good. The FDA has banned them and is giving food companies just three years to remove them from their products. Woohoo! The egg is back on the good food list. Scientific findings are too strong for the Guidelines to ignore this one. As far as cholesterol goes, the limit has been lifted. Hopefully this means bland egg whites and egg beaters will hit the road. Good riddance. 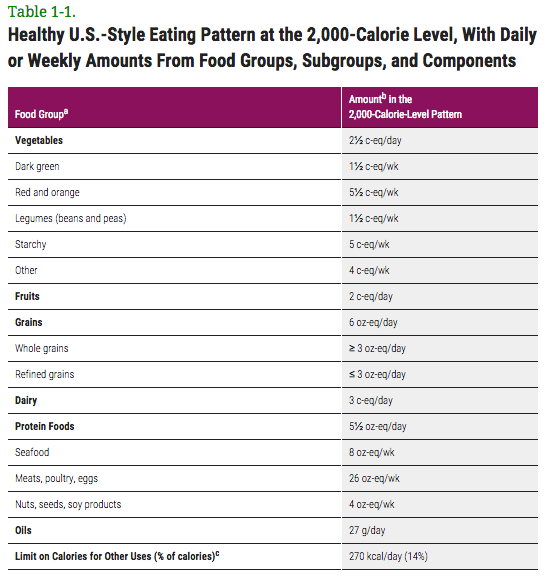 Only two and half cups of vegetables are recommended per day. Two and half cups is equivalent to one bell pepper and four spears of asparagus. That’s it. Per day. Vegetables are our top defense against illness. They are packed with phytochemicals that are vital for optimal health and disease prevention. Plants protect against DNA damage, oxidative stress (which is fought against with plentiful antioxidants), reduce inflammation, slow cancer growth and many other benefits. And plants high in chlorophyll, like dark leafy greens, have protective properties that counteracter the effects of red meat’s carcinogenic proteins. In order to fight illness and disease, studies show we need at least five servings of vegetables per day to begin seeing decreased risk. The government’s guidelines are half of the beneficial level. If you really want improvements in your health, up those veggies to 8-9 servings. Ten percent is still a hefty amount though. That’s 200 calories or 50 grams of added sugars per day. Say you have one bottle of vitamin water (125 calories from sugar) and one Cliff Bar (80 calories from sugar), you’re already over the limit. And that could just be lunch. The Word Health Organization also calls out to reduce added sugars to less than ten percent. Although they go one step further, advocating that below five percent (25 grams of sugar) will offer more health gains. Added sugars like refined white sugar and high fructose corn syrup are 100% empty calories, with zero nutrition. They only harm your body. Two-thirds of the US in overweight, and much of that blame is pointed at sugar. How can the guidelines be so lax on something that is sickening it’s population? Americans like salt. A lot. We have the processed food business to thank for supporting this addiction. Salt prevents foods from spoiling and makes it irresistible to our taste buds. Chips, “cheese” products, frozen dinners, many restaurant meals and most of the items you find in the middle of the grocery store are overloaded with salty appeal. Take a look at this chart. The last line demonstrates the level of sodium intake. Close to 90 percent of the population exceeds the recommended level, consuming an average of 3,440 mg per day. The guidelines sets the limit to 2,300 mg per day. This is one recommendation I can support since it is pointed to a reduction in processed foods. “Nutritional needs should be met primarily from foods.” I agree 100 percent with this statement in the Guidelines. Real nutrition comes from whole foods. Yet the actual recommendations are for few real foods. Refined grains that have been fortified with essential nutrients are ranked higher in priority than vegetables. And to still advocate for seed and vegetables oils is to blatantly ignore current scientific findings. Michael Pollan gets it right in his new In Defense of Food documentary. The science is presented accurately, with weigh-in from credible nutrition experts. It is a Must Watch. Then recommend it to everyone you know. I would love to see this shown in every high school across the country. In an idealized world, we can push politics and big food lobbying aside and focus on the ingredients of a healthy diet. Until then, steer clear of government nutrition recommendations. Still Think Low-Fat Dairy is the “Healthy Choice”? Think Again! New Diet Guidelines Urge Less Sugar for all and less meat for boys and men. The Amazing World of Plant Phytochemicals: Why a diet rich in veggies is so important!